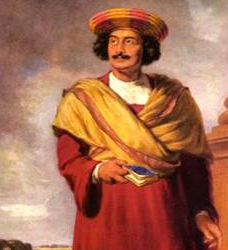 Raja Ram Mohan Roy was a zealous Social reformer holding modern and progressive views. He was born in 1772, in a prosperous and orthodox Brahmin family at Hoogly in West Bengal. He stood firmly against all sort of social bigotry, conservatism and superstitions and advocated English and western education for his countrymen. Raja Ram Mohan Roy was a great scholar too. He made a wide study of different religions of the world including Christianity and Islam. He also knew many languages like English, Persian, Arabic, Latin, French and Hebrew. He was also a great scholar of Bangla and translated Vedas and Upnishads into Bengali. He was honoured the title 'Raja' by the Moghul Emperor. Raja Ram Mohan Roy believed in the fundamental unity of all religions. In 1814, he founded, 'Atmiya Samaj' and in 1828, the 'Brahma Samaj'. Through these organisations he wanted to expose the religious hypocrisies and to check the growing influence of Christianity on the Hindu society. By far, the greatest achievement of Raja Ram Mohan Roy as a social reformer was the abolition of 'Sati' in 1829, child marriage and 'Pardha'. He was been rightly called the 'Father of Indian Nationalism'. He died on 27th September 1833, in England.